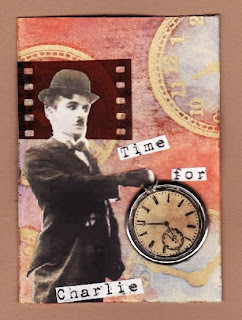 Over at Steff's Stuff this weeks challenge is time. So I decided I was going to do this challenge and what was I going to come up with? I thought and thought and sometimes my thinking gets a little bizzaro but I was on a mission. I stamped my background with Versamark watermark ink with a Maya Road clock stamp then embossed using a clear embossing powder. . Then I used watercolours and blended the colours as I went. Then I ironed the paper to remove the embossing, this helps reveal the stamped image a little more into the watercolours. Then I found a pic of Charlie Chaplin and printed him off. I stamped a clock image and embossed it, distressed it a bit then used Glossy accents on the face of the clock then put that in a huge brad I had and it fit just nicely. I also routed around and found a piece of blank film strip from some pictures that I had developed years ago. That stuff comes in handy now. And I put it all together and named this Time for Charlie. I hope Steff thinks this will fit into her challenge. Poor Charlie, does anyone even remember him ??? I know the younger generation have no idea who he was. Actors like these made people laugh, they usually did more than one thing than act, they sang, they danced, they were multi talented and not all of them were Hollywood good looking. Anyways I thought this was a good title. Time for Charlie is up for trade so if you are interested either leave me a comment or email me. I love it...what can I offer for a trade? Minutes after I posted Charlie he was spoken for and will be leaving the country to Australia tomorrow. Thank you girls for your kind comments. Mum I am onto something for you. Lucky person in Australia...hmmm, wonder who that could be...lol. Love new blog bkg. Les and so appropriate for upcoming fun.